Sometimes unlikely stuff plays out up there on the screen. Take the new Overboard. Really. This new version, directed by Rob Greenberg from his screenplay written with Bob Fisher and Leslie Dixon (who wrote the 1987 original) allows Eugenio Derbez and Anna Faris to wring every ounce of humor from the premise. You may recall: rich person falls off their yacht, suffers from a bout of amnesia, and ends up serving at the pleasure of a regular person previously treated poorly. Back in the 80s, it was Goldie Hawn who played the haughty role and Kurt Russell’s manly man who moved her unknowing mind into his house full of kids after he saved her from death. In the new one, genders are reversed. Derbez’ poohbah-in-waiting is pushed from the family yacht after treating the carpet cleaner played by Faris shabbily. She takes him in with her kids after he washes up. OK, you gotta figure, they warm to each other. You gotta love the chemistry between Derbez, the Mexican star who greatly deserves the inroads he’s making in U.S. cinema, and Faris, who carries just enough bark, bite and puppy eyes. 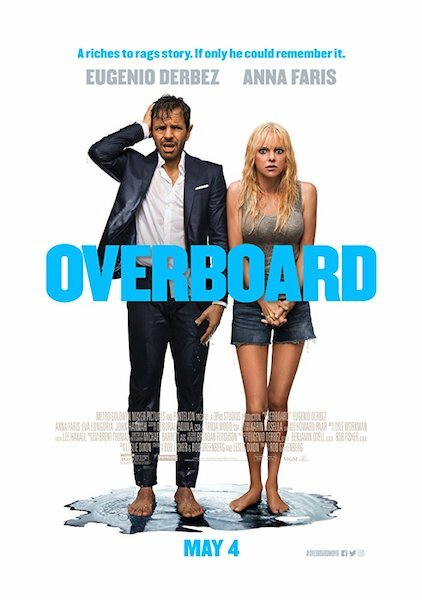 Central New Yorkers can see Overboard free as part of the Liverpool Public Library’s Mixed Bag Movie series at 2:30 p.m. Friday, April 5, at NOPL-North Syracuse. I think you’d like it, Beth, on a library borrow. I will watch this one! I’d watch it again, MBC.